Home / Archive by Category "Coverage of WPD"
We the People of Detroit was mentioned in an article entitled “We Are the Opportunity in Our Crises” by Tawana “Honeycomb” Petty in the Spring 2017 issue of Riverwise. 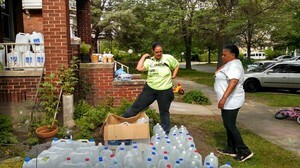 An organization fighting to provide water and other services to Detroit’s poor and elderly credits the Presbyterian Committee on the Self-Development of People for helping get its efforts off the ground. “We the People of Detroit” is a grassroots initiative formed in 2008 to fight city government’s takeover of the public school system. Over the years, its mission has grown to improve the quality of life for city residents, focusing on such issues as workers’ rights, pensions and ensuring people have access to clean water. Group leaders said they found mothers knocking on doors seeking water for baby formula and people who had been living without water for lengthy periods of time. 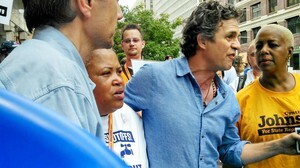 We the People of Detroit has worked to prevent water shut-offs that and SDOP has stepped in to assist. In 2013, Detroit filed for Chapter 9 bankruptcy, with an estimated debt of $7 billion. The city continues to work on its recovery while thousands of people remain out of work and struggling to meet their daily needs. We the People of Detroit has been working with 128 nationwide attorneys under the leadership or Alice Jennings, Esq., on litigation in hopes of ensuring a basic minimum standard and access to clean, affordable water. Taylor and Lewis-Patrick both say water rates have increased more than 123 percent in the the last two years while nearly 50 percent of the city’s population is out of work. Initial grant funding has allowed We the People of Detroit to provide a centralized base of operations. September marks the 45th anniversary of SDOP’s creation. Since its inception, it has awarded more than $100 million to communities of economically oppressed people in 67 countries including the U.S.
“We wish there was no need for ministries like this, but the need is greater than it’s ever been,” said Cynthia White, coordinator for SDOP. The Rev. Curtis A. Kearns, a former SDOP national committee member calls the ministry a unique initiative with a desire to stand in partnership with communities in need. Pay Rent or Drink Water!